SA's Got Talent disappeared this year but now there's a new show on the scene to take its place: Maak My Famous (Make Me Famous). It's a 13-episode reality talent show and the search is on for new talent and acts of all kinds. Jugglers, singers, comedians, hip hop troupes, people who can dance on their little fingers... any act by any age in any language can enter. 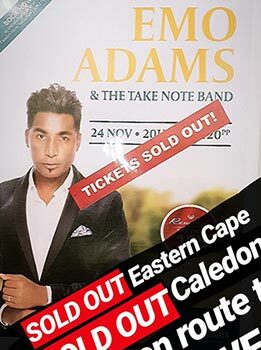 The show started as an online search by singer and producer Emo Adams who put out a call on his Facebook page, under the title Wys My Jou Talent (Show Me Your Talent). Emo and KykNET hooked up and it's been turned it into a 13-episode reality series. The prize: A year contract with Emo's All Stars Productions & Records and a tour with Emo in 2019. "As kykNET we are very excited to join Emo on his talent search and to convert it into a TV series. Emo has poured his heart into this project and there has been so much passion from his side. Emo has a natural talent to make people feel comfortable and that is why there were so many entries already. This new series will redefine the talent search genre." "I just wanted to give people the opportunity to show their talent to the world. Doesn’t matter where they come from or what their background is. Whether they are from a big city or a small town. The fact that kykNET wants to join my journey, means that they too see the necessity for this project." Deadline for entries: Monday, 31 December 2018.